Mankind has formed a special bond with dogs ever since we’ve been able to train them to do various tasks. Hunting, guarding, and herding were some of the most popular uses for dogs throughout history. Today, we use them to catch fleeing criminals, find hidden drugs, and be our loyal companions. The following stories recount just how loyal dogs are—from staying by your side during excruciatingly difficult situations to sacrificing their very lives to protect you from a wild animal attack. As it turns out, dogs would never hesitate to jump into life-threatening situations to save their owners or even complete strangers. 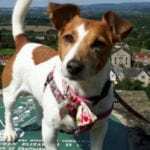 In Cleckheaton, England, a nine-year-old Jack Russell named Jess managed to save her owner’s life after some quick actions. Rebecca Brookes, Jess’s owner, started experiencing a severe asthma attack one day. In the midst of her uncontrollable coughing and gasping for breath, Jess sensed the danger and promptly fetched Rebecca’s inhaler from her room. Once Rebecca recovered from her asthma attack, she decided to see if it was just a coincidence that her dog came to her rescue. She placed her inhaler in a different room and coughed a little to see what Jess would do. Much to Rebecca’s surprise, Jess started looking for the hidden inhaler, found it, and brought it to her owner. Rebecca told her dad about it. He tried to get a reaction out of Jess and started coughing as well. Yet, as a definitive display of her intelligence, Jess knew that he was just pretending and didn’t really need an inhaler. After her heroic feat in saving her owner, Jess grew to be a real help by fetching Rebecca’s car keys, her shoes, and even her letters. In Anthem, Arizona, Paula Godwin decided to treat her dogs to a refreshing hike outside. While taking a leisurely stroll on a hiking trail, Todd the golden retriever noticed that Godwin was about to step on a rattlesnake lurking on the path. Just as the rattlesnake pulled back to strike, the young pup jumped in the way and absorbed the devastating impact of the strike, sustaining a gruesome bite on his snout. Godwin rushed little Todd to a local animal hospital for immediate treatment. Amazingly, Todd survived the rattlesnake bite and made a full recovery. Godwin shared the whole ordeal on social media, where the story spread like wildfire. A crowdfunding account was opened in honor of Todd to gather enough funds to help other pet owners who face the threat of similar injuries in the area due to the abundance of venomous snakes and reptiles. In Louisville, Kentucky, a woman credited her rescue dog with helping to fight off a man who had broken into her home. Layla the pit bull was rescued by Kelsey Leachman back in 2016 when Leachman found the dog malnourished and covered in pests like ticks and fleas. Then Layla returned the favor and rescued Leachman. On the night of the incident, Layla and her owner were in the living room watching television when the dog started getting uneasy. The tense pit bull ran into the kitchen, barking and growling all the way. Obviously sensing that something was wrong, Leachman got up to investigate. Standing in her kitchen was a man she didn’t recognize. Leachman decided to make a run for her front door, but the mysterious man ran after her and tackled her to the ground. Layla was barking and biting at the man’s legs the whole time, and Leachman was able to get out from under her attacker with the help of her loyal pit bull. Layla scared off the intruder by chasing him out of the house. Leachman called the police right away, and they arrived at the scene with their canine unit to track the suspect. Unfortunately, the dogs lost the suspect’s scent at a nearby high school. It is assumed that he drove off in a car. Leachman was eternally grateful for her pet’s valiant efforts, stating that she couldn’t have overpowered the intruder by herself. A family from Bastrop County, Texas, adopted a dog named Chrome at Bastrop County Animal Shelter in 2017. Laura Smith, Chrome’s owner, was sleeping in her home with her two boys one night when Chrome woke her up at around 1:00 AM. Chrome stayed with her until she realized that her home was on fire. Then Chrome took off to get the two boys. Everyone managed to get out of the house before the blaze consumed the house and nearly all their possessions. Smith believes that the fire was due to bad electrical wiring in one of the walls of her home. Yet the house sustained so much damage that an official cause of the fire couldn’t be determined. As the house is situated so far from the station, it took 11 minutes for the fire truck to arrive. A 56-year-old man from Central Queensland rolled his quad bike at Bondoola on a rural property. He was pinned underneath his bike and unable to get help. The man was stuck there for an entire night and suffered from hypothermia. Yet everything could have been worse if it wasn’t for his trusty cattle dog keeping him warm. A neighbor out for a ride on his horse noticed the overturned quad bike and stopped to help by calling emergency services. Capricorn Helicopter Rescue Service crewman Garth Snaidero confirmed that the man might not have survived without his dog. The man was airlifted to a nearby hospital, and the dog went along as well. Believed to be a Smithfield cross, the canine rescuer appeared to be in good spirits and even took a liking to the helicopter’s pilot. In Black Mountain, North Carolina, Tiffany Merrill let her 2.2-kilogram (5 lb) toy poodle named Pickle outside their home for his morning walk on August 31, 2018. The door was barely open for a moment when an aggressive and seemingly fearless bear came bursting through. According to Merrill, the bear weighed 68–91 kilograms (150–200 lb). Fearing for her life, Merrill screamed for her children to close their bedroom doors. She dived behind her couch before the bear could pounce on her. Yet, Pickle was able to distract the bear and lead it outside the house. Once outside, the bear and the poodle attacked each other ferociously. As the bear retreated, Merrill rushed to her dog’s aid and took him to a vet. But it was too late. Pickle the toy poodle had sustained too many life-threatening injuries and died saving the life of his owner. Merrill was only slightly injured during the whole ordeal. She sustained a sprained ankle and a sore back. The bear is still on the loose. All the authorities could do was to inform Merrill that she could shoot the bear the next time she felt threatened. Jane Lavergne from Ottawa, Canada, lives with a lung disease and relies on an oxygen tank to help her breathe. One night, she noticed that she was struggling more than usual to breathe properly. So she decided to sleep on the couch in the living room downstairs to be more elevated. Yet, she collapsed and passed out the next morning when she tried to reach for a glass of water. Her 11-year-old Yorkie-Pomeranian mix, Noah, noticed what was happening and ran upstairs. He barked incessantly at the door of Lavergne’s husband, Ken, in an effort to wake him up. Luckily, Noah’s efforts paid off. Ken got up and noticed his wife slumping unnaturally on the couch, which prompted him to call 911. The ambulance arrived to take Jane to the hospital, where doctors discovered that she was suffering from pneumonia. Combined with her lung disease, the pneumonia caused the collapse. Jane was placed on life support when her husband arrived at the hospital. The ambulance driver told Ken that Jane was minutes away from succumbing to her condition. Fortunately, Noah’s vigilance saved her. In Lake View, New York, Ronene Ando and her husband, Chris, are advocates for pit bulls and even own one called Ruby. She’s a trained therapy dog for the “Paws for Love” initiative with the local SPCA. One night, Ruby barked incessantly for nearly an hour and a half. As she’s normally an attentive, well-trained dog, the couple knew that something was seriously wrong. Once the couple started looking for a reason why Ruby was barking, they noticed the smell of propane in the air. This was probably due to the newly installed propane heater in their basement. The couple was able to escape their house before carbon monoxide poisoning could occur, and it’s all thanks to Ruby’s keen sense of smell and intuition. In Girdwood, Alaska, a man lives close to the 39-kilometer-long (24 mi) Crow Pass Trail. His name is Scott Swift, and he is the proud owner of Nanook the Alaskan husky. Nanook loves to follow hikers on their journeys and learned the whole route by heart. Swift is so used to it that he doesn’t even mind when he notices that his dog is gone. One day, Amelia Milling, a student from the Rochester Institute of Technology, was doing a three-day solo hike on the Crow Pass Trail when she lost her footing and fell 183 meters (600 ft) down an icy mountain. Out of nowhere, Nanook came to her aid. He stayed by her side and guided her back to the main path. Unfortunately, Milling slipped while trying to cross a river. For the second time, Nanook came to her rescue and helped her paddle to safety. Milling wormed her way into her sleeping bag to preserve her declining body temperature. At first, she thought that she would be able to recover from the unexpected dip. But once she realized she was about to pass out, she hit the “SOS” button on her satellite messenger. Nanook helped to keep her awake by licking her face. Soon, a helicopter arrived to take her to safety. After that, Nanook’s owner engraved his collar with the words “Crow Pass Guide Dog.” Much later, Swift realized that his dog was not only accompanying other hikers but also saving their lives. Since Milling’s ordeal, Nanook has saved three other hikers. At least, those were the ones that Swift knew about. He soon started a social media page to find other people helped by his young pet. After a few days, dozens of rescue stories started surfacing. The most astonishing fact about Nanook is that he wasn’t trained to be a rescue dog. In fact, he was adopted by Swift at an adopt-a-pet event at a local shopping center parking lot. Charles Bailey from Cape Breton Island sustained a concussion days before he drove through New Waterford, Nova Scotia. He blacked out at the wheel, causing his truck to collide with a telephone pole. The vehicle tumbled over several times before coming to a stop in the middle of the woods, out of sight from the passing traffic nearby. Bailey spent 10 hours in his truck, completely unconscious. When he came to, he found himself in a bed at a Halifax hospital, recovering from a brain hemorrhage. Even though Bailey has no recollection of the crash, his mother firmly believes that his dog, Dallas, is the reason why he is still alive. His extraordinary dog was by his side the whole time, providing him with heat and keeping some of his limbs from sustaining serious frostbite damage. It was only when Dallas was seen running along the road close to the crashed car that someone was able to find the unconscious man. Along with the brain hemorrhage, Bailey sustained third-degree frostbite damage to his right foot and a fracture in one of his spinal discs. His arm also had to be cut up to release the intense blood pressure.